Hundreds of positive feedback, Thousands of encore requests and Tons of Happy faces later Virgin Colombo is here to deliver! For the past two years Virgin Colombo has re-defined the mere essence of Night life with many successful events to its credit. Virgin Colombo is not only one of Sri Lanka’s Best Event Production Company but it’s a Brand that adds creativity and unlimited entertainment to your regular night out making every event more than just an experience. This February we know there’s only one thing on your mind; Valentine’s Day!! So prepare yourselves for ? FOAM LOVE ? 2011 yet another phenomenal experience on the serene and seductive sands of Hikkaduwa. That’s right! 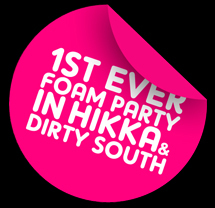 The creative experts at Virgin Colombo are taking you DOWN SOUTH this Valentine’s for the first ever Foam Beach party in Hikkaduwa!! 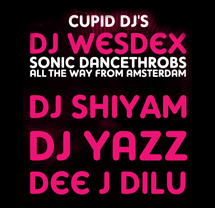 We’ve got our trademark combination of the Beach and Foam tweaked up with performances by the renowned DJ Wesdex from AMSTERDAM, and three of Sri Lanka’s Top 10 Djs that promise to keep you ecstatic throughout the night! Watch the shores of Hikkaduwa personify and enrapture you in an ambiance of love, passion and romance combined with music, foam and the beach. Indulge all of your senses, let the foam drip on your body, let the music take control and watch the ocean hum the bass as you celebrate love down South!